Ancient Asian origin of Golf ? Home > Golf History > Asian origin ? While it is generally agreed that the term golf was borrowed from Middle Dutch as an alteration of the word colf or colve (a stick or bat used in a ball game called kolven), modern Golf, as it is known today, originated from a game played on the North-Eastern coast of Scotland during the 1400's. unaccessible to the majority of western historians since most of the studies are only available in Chinese. That doesn't in any way detract from the possible role that an ancient chinese ball and club game have played in the history of golf. Quite the reverse, we may say that a comparative analysis or research of the origin of golf (or any other sport), which has failed to consult Chinese sport history, lacks validity. According to the Chinese professor Ling Hongling, the earliest historical record of this Chinese precusor of golf, called Chuiwan ("chui" means hitting and "wan" means small ball in Chinese), dates back to 943 AD, in records written by Wei Tai of the Song Dynasty. The game consisted of driving a ball with a stick into holes on the ground in very much the same way as the modern game of golf. Ling Hongling claims that the existence of Chuiwan in China pre-dates the advent of golf in both Holland and Scotland and that it was brought to Europe by the Mongolians in the 12th and 13th centuries. Several paintings and murals dating from well before the first records of golf in Europe in the 15th and 16th centuries and the comparison of the Monograph Wan Jing publised in 1282 AD with the early golf books describing the rules and description of the games further support the theory that both games are basically identical. 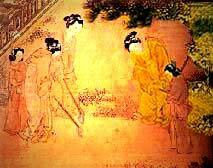 The game was first known as Buda during the Tang Dynasty (618-907), and was almost as popular as polo. Later called "CHUIWAN" (ball-hitting) in the Liao and Jin dynasties (916-1234), it became the favourite passtime among the ordinary people and with palace maids, who liked to play it on the Hanshi Festival. The striking fact regarding chuiwan is, as we said, that the rules of this game are extremely similar to golf while, on the contrary, the rules of paganica or similar European games of that age are much more similar to hockey or polo. Later on, the game developed into a competitive sport in the Song and Yuan dynasties (960-1368). The highest development occurred with the emperor Huizong and his grandson emperor Zhangzong who were avid chuiwan players. A monograph on the ball game describes the rules of play of Buda into details, and mentions the specifications of the playing field and apparatus, as well. It shows that early in the 12th century the game of Chuiwan was played in the imperial courts as an amusement. The imperial clubs were made of the most precious materials like gold decorated with precious stones. In the Ming Dynasty the game gained even greater popularity, especially among young citizins. Scenes of Buda play are depicted in the illustrated scrolls from the early Ming Dynasty (1368-1644) "Emperor Xuanzong of the Ming Dynasty Is Playing " and the traditional Chinese painting of beautiful women done by Ming Dynasty painter Du Jin, both of which are now kept in Beijing' s Palace Museum. They show suigan, or ch'ui wan, described as "a game in which you hit a ball with a stick while walking", a game indeed very similar to golf. On the picture left you see three female players watching the ball rolling while it is approaching the edge of the hole. The Ladies are competing and the two servants are shouldering the sticks at their service. Source: A Picture Collection of Chinese Ancient Sports (1986) by Shao Wenliang. By the Oing Dynasty ( 1644-1911 ), however. the game was rarely played. Actually, Chuiwan could not be found in any historical documents since the middle of the Ming Dynasty which explains why most people in China considered golf a foreign game when it was first introduced into their country. They could not see any similarity with Chuiwan as all references to this ancient sport had long vanished from the collective memory. Worth to mention are also a ball and club game called "KHI" related to chuiwan and played in Laos more or less at the same time when Chuiwan was being played in China and an equestrian ball game called DAKYU ("Da-kyu", which means hit a ball), played by the Japanese aristocracy of the Nara-period in the 8th century b.c. More than likely, however, the Chinese version of the game was more similar to golf and was one of the ancient ball games with the highest similarities to modern golf. Learn what mistakes you can afford to make, how to play to your strengths and hide your weaknesses, and discover the ten mistakes amateurs make that pros never do. Golf-information.info 2005-2011 © All rights reserved. Shao Wenliang, A Picture Collection of Chinese Ancient Sports (1986). China, People's Sports Publishing House, p. 156-160. Explores the possible origins of the sport staring with ancient Rome, and moving through all the significant events and developments of the sport. With biographies on significant golfers. An illustrated reference book including the history of the game, Championship Courses of the World, the evolution of the Golf Ball and Club design, the Hall of Fame section with golf legends and today's stars, championship records, developments in the women's game, and the top golf architects and designers of the modern game.